The Green Girl did the Wrigley River Run 5k on Saturday. 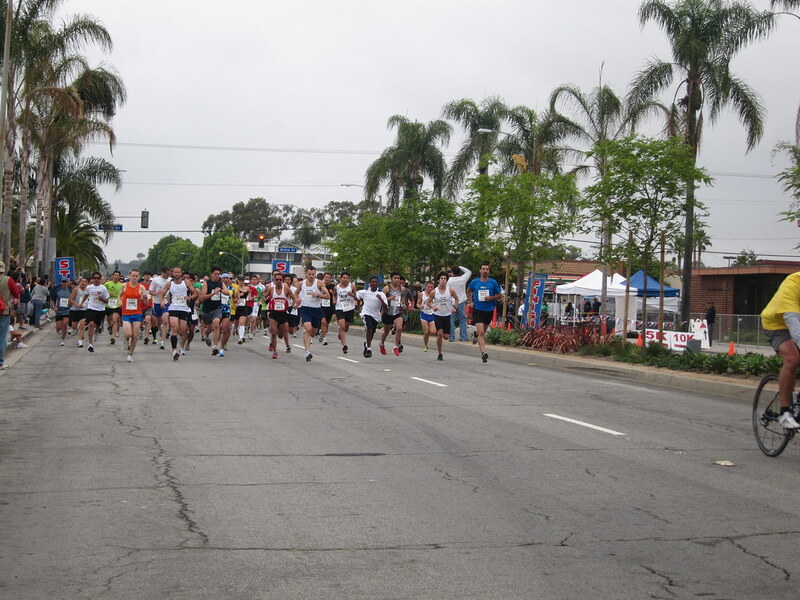 The proceeds from this local race go to the Long Beach Neighborhood Foundation (LBNF) to support programs for at-risk city youth. Some of the Sole Runners are members of LBNF so a group of us went out to support the race. I'll be honest, the Green Girl went into this race with something to prove to the Wrigley River Run. I was determined to not let Wrigley River Run history repeat itself - I would not go out too fast and I would do everything in my power to PR. This week, I really pushed myself on my morning runs in Denver. I was convinced the short-term high altitude training would pay off. 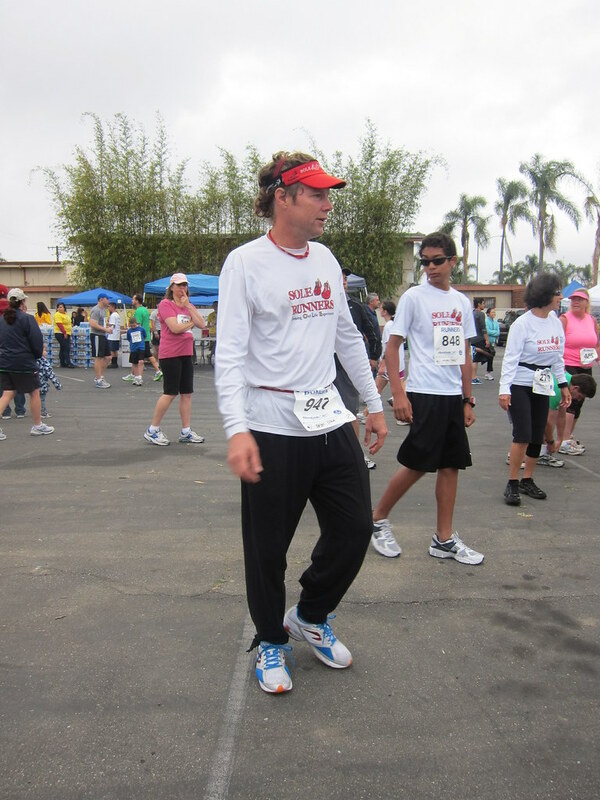 Pre-race, Coach Steve warmed up all the Sole Runners with ChiRunning body looseners. The 10k started an hour before the 5k and runners who could finish the 10k in time had the option to run both. I cheered on the 10k runners as they headed out onto the course. Before the 5k, Coach Steve and I discussed my race strategy. He told me to really focus on Mr. Green Garmin and pace myself from the start. His confidence in me was comforting. Two minutes into the race, Mr. Green Garmin let me know I was down to a 9:01 minute mile. I immediately took a deep breath and slowed down. I focused on the ground directly in front of me and blocked out everything else. The first mile felt great but fatigue started to set in on the second mile and by the time I reached the halfway point, I was fighting the urge to puke. I had hoped to maintain a more consistent pace but I was all over the place. I would slow down to a 12:30 and then realize I needed to hustle. Then, I'd look at Mr. Green Garmin again and I'd be back at at 9:00 minute mile. I gave that race everything I've got. At the Finish Line, Mr. Green Garmin said 34:22. My PR from 2008 was 34:48. Since the race wasn't chip timed and I didn't start in front, I had my doubts it would be an official PR but when the results were posted, my time was 34:41. I had PR'd by 7 seconds! Yay for a PR! I don't know what I would do without my Garmin. I love knowing my pace because I have trouble staying steady too. great job on your PR! Mission Accomplished, excellent job!!! So so soooo very happy for you! Superb! Congratulations on your PR! WOo hoo! PR's are ALWAYS a reason to celebrate. And I love the pic! Way cute! GREAT STRATEGY, GREAT RACE! I love reading about it when a plan comes together. 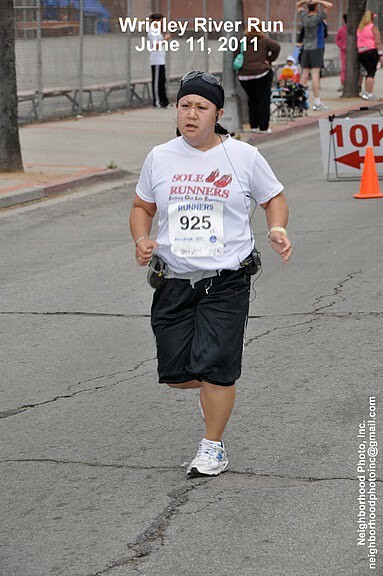 I also did this race and will recap it in the next day or so. This really was a great course. And super fun atmosphere! Great job, Green Girl! PR, way to go! Isn't this where we met last year? Or maybe the year before. Man. I definitely need to get back to training. Congrats on the PR!